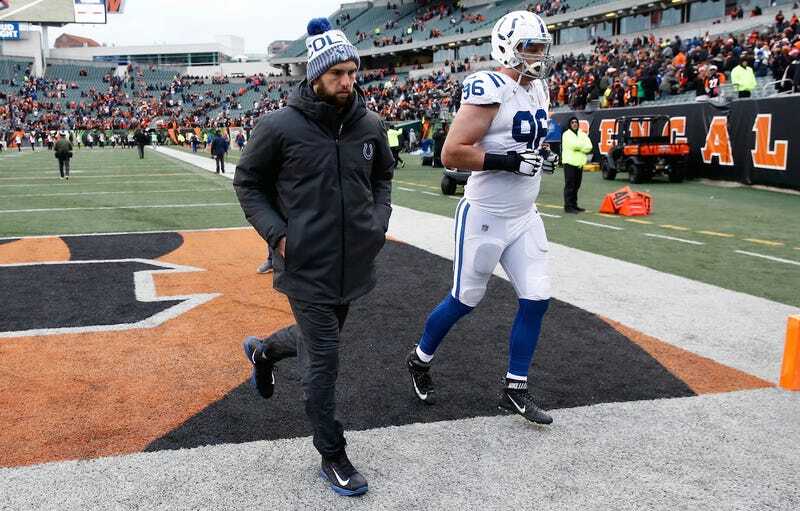 Indianapolis Colts QB Andrew Luck didn’t play at the start of the season because of his injured shoulder, and now he won’t play for any part of it. The team officially placed him on injured reserve for the remainder of the year. Though Luck had offseason surgery on his throwing shoulder in January, he hasn’t gotten better. He tried throwing for a little bit in October but had to stop, and then he took cortisone shots, which didn’t help. This week he was visiting a series of specialists; they apparently didn’t like what they saw. In today’s press conference, GM Chris Ballard said there was no indication that Luck’s career is in jeopardy, but given that the injury supposedly occurred in a 2015 game, it’s quite concerning that this has stretched on this long. If it’s not the severity of the injury that’s distressing, perhaps it’s the Colts’ handling of it. In August, team owner Jim Irsay had said that Luck might not be ready for Indianapolis’s opener, but would be ready for the season. That turned out to be horseshit. (Ballard described Irsay today as having been “very optimistic.”) Instead, the 2-6 Colts will use Jacoby Brissett as they play out the rest of a useless season.